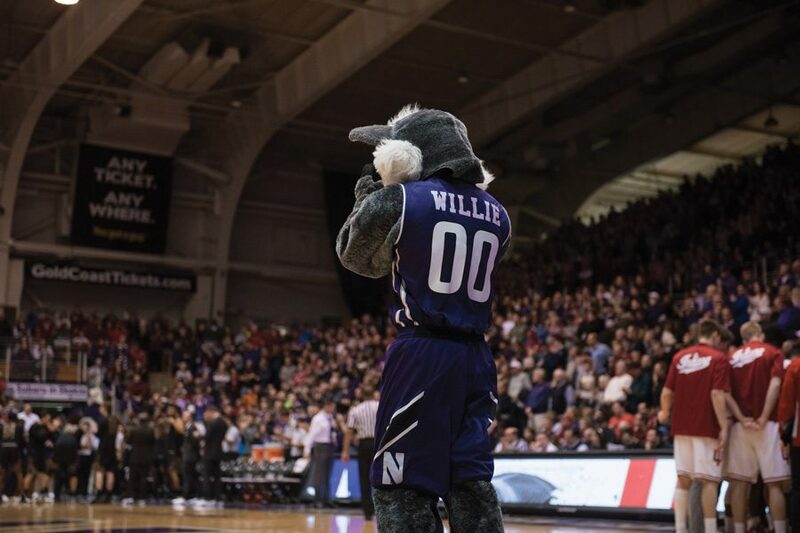 Willie the Wildcat parades the sideline at Welsh-Ryan Arena during Northwestern's game against Indiana on Sunday. The game against the Hoosiers was sold out. Northwestern had sold out three out of its five remaining games as of Thursday, the program announced in a news release. Remaining home contests against Rutgers (Feb. 18), Michigan (March 1) and Purdue (March 4 or 5) have sold out, per the news release, and the No. 25 Wildcats (18-5, 7-3 Big Ten) appear poised to shatter last year’s attendance figures as they climb the Big Ten standings. NU has averaged a home attendance of 7,582 this year, up from last season’s average of 6,914 — one of the program’s highest averages since the NCAA began recording data in 1978. NU’s game with Indiana on Jan. 29 marked its first sellout of the season, though the Cats have drawn at least 7,000 for every home contest in conference play. NU’s contest against Nebraska drew 7,108 fans and the raucous atmosphere prompted Nebraska coach Tim Miles to praise the crowd. Due to Welsh-Ryan Arena’s limited capacity of 8,117, the second-smallest in the Big Ten, the Cats rank 13th in average attendance per game this season. They rank second in average percent-of-capacity filled, however, and have experienced a steady rise in crowd sizes over the past decade. NU will play at the 18,500-seat Allstate Arena in Rosemont next season as Welsh-Ryan Arena undergoes renovation. The Cats’ games against Illinois on Feb. 7 and against Maryland on Feb. 15 had not sold out as of Thursday, according to the news release.